These days, there’s a lot of talk of hipsterism, and I’m never quite sure if it’s something positive or negative. Swirls of question marks abound. Is it a fashion term, a music term, a gentrification-related term? What I do know is that people don’t really take kindly to you calling them “a hipster“–the term seems somehow dismissive or infantalizing. My parents appear to have a completely different idea of what hipsterism really is. “Isn’t that something to do with jazz music?” I can remember my father saying, when I brought it up. No, Dad. Not really. “Oh, so they’re the bohemians, then.” Well, kind of. Do some research on what “hipsterism” is/means, and then decide what it means to you. 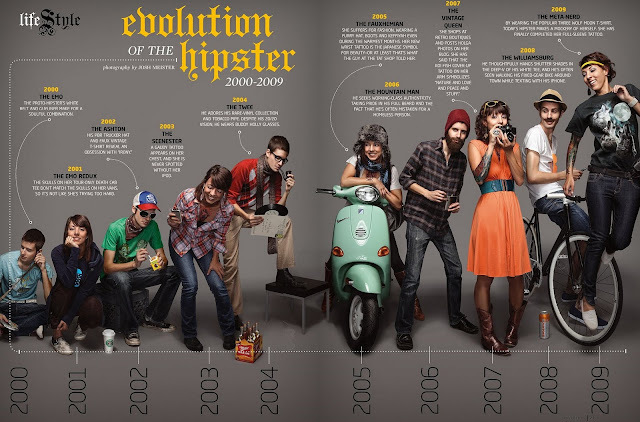 Write a piece in which your main character is either a hipster without knowing it or someone who is knowingly trying to engineer their existence into one that is certifiably “hipster.” You could even construct an entire world of hipsters, with lots of connections between these young, artsy characters. And hey, have you signed up for the write-a-thon yet? Whether you’re planning on coming or not, check out our firstgiving page and contribute. Every little bit counts.